And they compelled a passer-by, Simon of Cyrene who was coming in from the country, the father of Alexander and Rufus, to carry his cross (Mark 15:2). And as they led him away, they seized one Simon of Cyrene, who was coming in from the country, and laid on him the cross to carry behind Jesus (Luke 23:26). As they went out, they came upon a man of Cyrene, Simon by name; this man they compelled to carry his cross (Matthew 27:32). That’s it! This star of the Fifth Station of the Cross has no other reference in all of Scripture beyond a single sentence in each of the Synoptic Gospels. Who was he? Saint Mark is the first of the Evangelists whose Gospel came into written form. Simon of Cyrene is identified there as “the father of Alexander and Rufus” as though the writer expects readers to know of them. Saint Mark directed his Gospel to the early Jewish-Christian community, so Alexander and Rufus were likely known to him and to those who first read, or heard, his Gospel. There would be no other reason to include their names than an expectation that they would be quite familiar to Saint Mark’s readers. At the end of his Epistle to the Romans (Romans 16:13) Saint Paul wrote: “Greet Rufus, eminent in the Lord, and also his mother who is a mother to me as well.” Some Scripture scholars associate the Gospel of Mark with Rome, and therefore link it to Saint Paul’s Letter to the Romans in which Rufus is known as a devout Christian and leader. If this Rufus was the son of Simon of Cyrene, then it’s likely that being compelled to carry the Cross of Christ had a profound impact, not only on Simon himself, but on his entire family who then became known to Saint Paul. And Abraham took the wood for the burnt offering and laid it upon Isaac his son; and he took in his hand the fire and the knife. So they went, both of them together. And Isaac said to his father . . . ‘Where is the lamb for a burnt offering?’ Abraham said, ‘God Himself will provide the lamb for sacrifice’ (Gen. 22:6-12). And indeed, God did. In the theology of Saint John’s Gospel, Isaac was the heir of the Old Covenant. When Abraham, in obedience, was about to sacrifice his son, God stayed his hand. At Calvary, God did for us what he spared Abraham from doing for Him. He sacrificed His son, and no one would stay God’s hand. In the Synoptic Gospels (Mark, Luke, and Matthew) it is clear that Simon of Cyrene was a Jew. He would have no other reason to have been “coming in from the country” to Jerusalem at the time of the Passover. Simon is clearly a historical figure in the Gospels, and not a theological development. However, the inclusion of Simon’s city of origin, Cyrene, is both historical and theologically symbolic. Cyrene, an ancient Greek city in Northern Africa in what is now the coast of Libya, had a large Jewish Diaspora, a term that refers to the dispersement – or exile – of Jews beyond Jerusalem six to eight centuries before Christ. Cyrene represents in the Gospel the limits of the known world for both Jews and the Roman Empire. The fact that Simon of Cyrene had to carry the cross-beam for Jesus, and that Jesus dies so quickly, may well be attributable to the torture of scourging, during which other criminals sometimes would already have died (p.198). 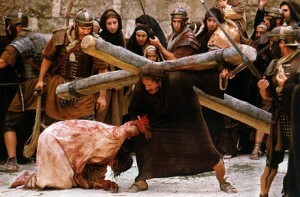 Critics of The Passion of the Christ deride it for its graphic and violent depiction of the scourging and crucifixion of Christ. It is an event of history, however, and it was not a gentle, civil affair. By the end of Simon’s brief journey with Christ, he was changed. In the film, he was now compelled from within himself to remain there with Christ, to finish it. That man, Simon, is me. One new reader of These Stone Walls recently asked in a message how and why I can hold onto faith in the face of so much discouragement. “Only a Christ-like man could carry such a cross as wrongful imprisonment for all these years and still inspire others to believe,” she wrote. I appreciated the sentiment, but “Christ-like” is not a term I would ever use to describe myself. I have tried to be an “alter Christus,” as priesthood requires, but on our shared road to Calvary, I relate far more to Simon of Cyrene. I pick up my own crosses reluctantly, with resentment at first, and I have to walk behind Christ for a long, long time before anything in me compels me to carry willingly what fate has saddled me with. I want to be like Christ, and I admire Mel Gibson — even the sinful Mel Gibson we see in his mug shot — for showing us His face. But I long ago had to settle for emulating Simon of Cyrene, compelled to bear the Cross in Christ’s shadow.